Movie 7 English and Japanese. Ancient. Garuru is the sound of a growl in Japanese. If you are Perfect or Final with a base attack of 590 or less at the beginning of the battle, discard one card from your hand whose type has the word Beast in it then take this card from your hand and place it in the Digimon Box. One of the 10 Warriors. Has the power of "flames"
If you use Psycho Blaster, the effect changes from +120 to +600. 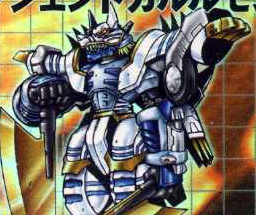 Were Garurumon (Blue Frame) + Win Ratio 80%!